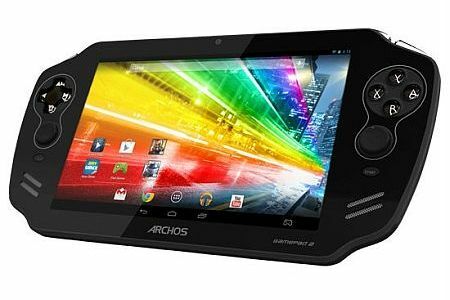 After the mediocre success of the Gamepad it looks as though Archos is going to be having another stab at the 7 inch handheld market. The Gamepad 2 improves on the original in many ways, this time with a higher resolution 1280×800 panel and the quad core RK3188 instead of the dual core RK3066 found in the original. Here’s hoping they stick a bigger battery in this time too. Visually the Gamepad 2 looks fairly similar, though it looks like they’ve gone with black instead of the charcoal grey this time around. No word on pricing yet though rumour has it they’ll cost around $200 when they’re released. In the last generation it was the JXD S7300 competing against the Gamepad, this time it looks like it’ll be the JXD S7800 against the Archos Gamepad 2. Both machines contain the same hardware internally so performance should be similar, though I suspect Archos’ software will be a little less buggy than JXD’s out of the box. WIll that be enough to warrant the rumoured higher price tag though? Thanks to earl and thedoctoroftech for sending this in! Hyperkin’s Retron 5 Now Available For Pre-Order. Where on this planet can one find this tasty little morsel? Good to see they went with IPS and higher resolution. 1280×800 should be enough to do scanline emulation (looked alright on my Nexus 7), although 1920×1200 would of course be even better. Hey did you see the new Yinlips YDP-G18D? Its 5 inch and has 2 analog sticks. Plus it doesn’t look that much like a PSP. I’m a little leery of this device after the last version having such an atrocious screen. I’m looking forward to when a powerful device like this that can run the PSP and Wii/GC emulators at full speed. Maybe not so long. Maybe next year the 64-bit 8-core MediaTek SoC might be good enough to do it.